Salzburg Hauptbahnhof old and new roof with winged design sculpture (May 2013). They have been rebuilding the Salzburg Hauptbahnhof seemingly forever, but making progress. 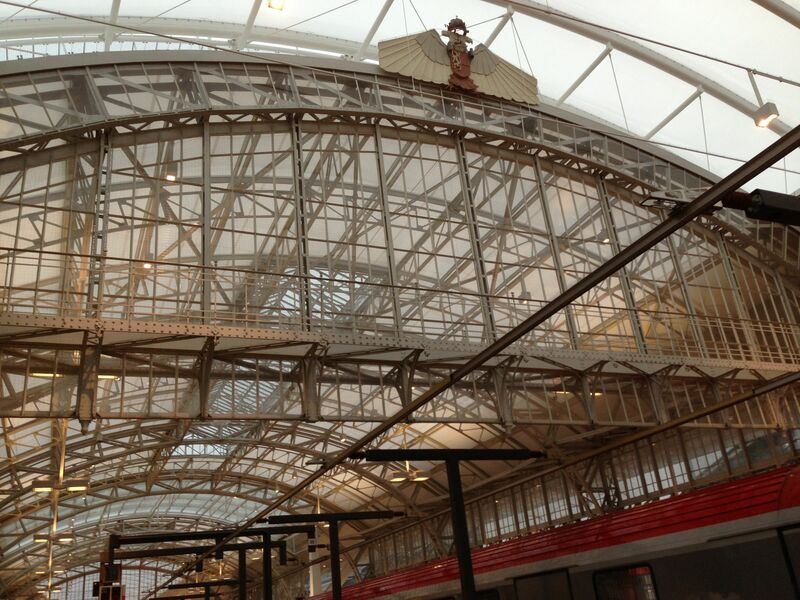 Here’s a photo of the old roof structure, renovated, and protected by the new, longer roof. I love the traditional design found on many stations and railway logo designs that makes use of the winged something (often it’s a wheel). There’s one visible here at the top of the old roof. Also visible in the photo is the rail above the tracks for providing electricity to the trains. It probably was necessary to use a rail in the renovated station because the electric catenary wire would have been too high.